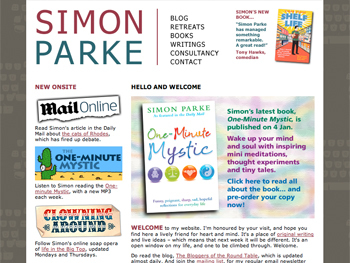 Simon Parke was a priest in the Church of England, but is now a freelance writer who also speaks and leads retreats. He’s the author of The Beautiful Life, subtitled ‘ten new commandments because life could be better’, Shelf Life (Simon’s three years working in a supermarket turned into fascinating portrait of life behind the till), and One-Minute Mystic, a book of mini meditations. I designed and continue to produce his website, which features a multi-contributor blog and the occasional soap opera, where Simon writes episodes in a drama which are posted every few days. Simon’s book Shelf Life started life in exactly that way on the site. The website also includes details of his books and speaking engagements, as you’d expect in an author website.